Envirosafe Ireland provide ST1 Balance Enclosures which are designed for weighing operations in pharmaceutical labs. ST1 enclosures are independently performance tested and proven to achieve containment levels of less than 15 nanograms/m3. 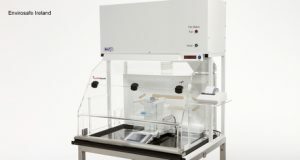 A granite base and engineered turbulent free flow ensure the stability of even the most sensitive analytical balances.